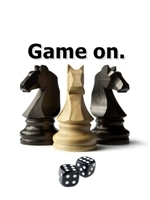 Chess dice transforms the ultimate strategy game by infusing it with good, old fashioned, roll the dice luck. If you don't roll the right number, you can't move the chess piece you want. There are 6 different types of chess pieces and a 6 sides on a die. That is clearly more than a cosmic coincidence. To play, you do need a basic understanding of how each chess piece can move. In terms of strategy, the use of dice levels the playing field quite a bit between players. Lady Luck will have a say in how you're able to move your chess pieces. Game Gear: One chess board with chess pieces, one or two 6-sided dice. Length of Game: Varies, but will go faster with two dice. How to Win: Checkmate the king. To begin a game: you can only move a pawn or knight. In chess dice, that means you must roll a 1 or 2. If you fail to do so, your turn ends and your opponent takes the dice. Moving pieces: You cannot refuse to move a chess piece. If you roll a 4 and can move your rook, you must do so even if it puts the piece in jeopardy. King in check: If your king is in check, your only play is to get out of check by moving the king, capturing the opponent's checking piece or moving another piece in between your king and the opponent's checking piece. Failure to end check: If your turn ends without getting out of check, you do not automatically lose the game. Your opponent does get a chance to roll and put you in checkmate though. Castling: This move can be accomplished by rolling a 4 or 6 when your chess pieces are in position to execute it. En Passant: When this move is possible, a player may execute it by rolling a 1. Pawn Promotion: If a pawn moves across to the opposite end of the board, any number rolled will promote it. However, it can only be promoted to the number rolled. For example, a player rolls a 2 so the pawn gets promoted to a knight. Win the game only by capturing the king. This eliminates the possibility of check or checkmate. Rolling Doubles: Rolling a pair gives the player the advantage of moving any free piece on the chess board. Castling: With chess pieces in position to make this possible, rolling doubles (in addition to the 4 or 6) allows player to castle the rook and king. En Passant: Rolling doubles gives the player the option of executing this move, when possible. Pawn Promotion: With two dice, a pawn is only promoted when a 1 is rolled. At that time, the number on the second dice indicates what piece the pawn is promoted to. Proteus chess dice appeals to chess and non-chess fans alike with a fast paced, strategic game. Each player squares off with 8 custom dice on a traditional chess board. The dice are etched with the chess piece symbols, with one exception: No king. In place of the king on the dice, you'll find a pyramid, which is a defensive symbol that cannot be captured. The game doesn't end with a check mate. The game ends when a player cannot make another move or only has one dice left. At that time, scores are compared to determine a winner. Players earn more points for capturing pieces with higher values (i.e. Queens). On each turn, a player must do two things: 1) Move a piece on the chess board AND 2) Rotate a different piece (i.e. rotate a bishop into a knight or rook). Like normal chess dice, the pieces are given numbers: Pawn (1), Knight (2), Bishop (3), Rook (4) and Queen (5). Oh, and Queen pieces had better watch out for "backstabbing", an interesting rule twist that makes her Royal Highness more vulnerable to capture. The rules contain several different variations that force players to consider new strategies and enjoy the game in an entirely new way. I highly recommend that you buy some Proteus dice and enjoy a fun, challenging game.